In our last blog post, we discussed how the AR-15 rifle was perfectly suited for use in predator hunting. While some companies make a unique model of AR-15 specifically designed for predator hunting, a standard AR-15 in any configuration can work just fine. There may be things you can do to modify the weapon you already have that will increase the weapon's usefulness in this application, but any AR-15 rifle can contribute to a successful predator hunting experience. We also mentioned that getting involved in this shooting sport can have benefits that translate into better techniques and skills in other applications in which you may use your AR-15 rifle (like target shooting, 3 gun competitions, or even defensive applications). If coyote hunting is your focus, selecting proper camouflage (whether in clothing or in a "blind" set-up) is crucial due to the excellent eyesight of these animals. The environment in which you plan to hunt should be the main factor in selecting which camouflage pattern to use. If you will be hunting in the Western U.S. on open prairies, your selection will be much different than someone hunting in the dense, swampy woodlands of the Southeast U.S. Typically, coyote hunting means sitting in a well camouflaged location and using calls and decoys to bring a coyote in to shooting range. The location for your blind set-up should be decided by access to unimpeded shooting lanes when the animal does come to the call or decoy. If a location is unproductive to your calling techniques, it's probably a good idea to move to another location within an hour or so. If it is a successful location and you were able to place a shot on a coyote, it is a good idea to be still and wait as another opportunity may present itself. Often multiple coyotes may be responding to your call, and the noise of gunfire isn't always a deterrent to them. Movement, however should be kept to a minimum while at a blind location. Predator calls can vary from expensive electronic calls to handheld wood or plastic calls with reeds that the hunter uses like a deer or duck call. The benefit of the electronic calls (even the less expensive ones) is that they can be placed and used in a location away from the hunter, thus reducing the chance that the hunter is detected when the animal responds to the call. 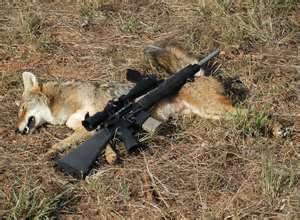 Ammunition choice is also important, though just about any .223/5.56 bullet can be used successfully in hunting coyotes. A few manufacturers (Hornady, Federal, Nosler) offer a varmint hunting line of ammunition, and any of these options would be a good choice. 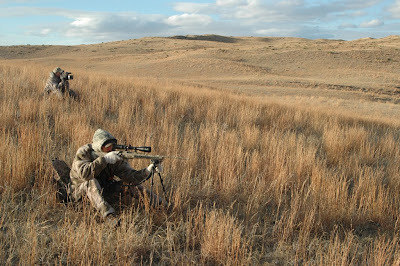 Even in heavily wooded hunting locations, the techniques used in coyote hunting (including accurate range estimation and the necessity to fire an accurate shot when the opportunity presents itself) will only make you a better marksman in other applications in which you use your rifle. The same benefits can be acquired by feral hog hunting (or any hunting experience, really). While feral hogs do not have the amazing eyesight that coyotes and other predators do, their sense of hearing and smell are quite good. Much like coyote hunting, it is important to know where these animals are active and position yourself in a location to view the animal's movement while not allowing them to know of your presence. 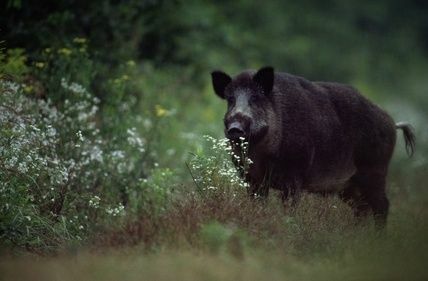 Techniques like still hunting and stalking can be used in feral hog hunting, where they may be counter-productive in hunting predators like coyotes and bobcats. 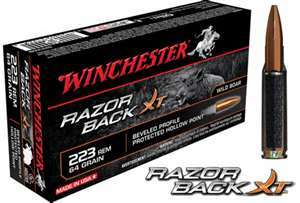 Ammunition selection for feral hog is a little more narrow in options. These animals have a fairly tough hide and it is important to choose a bullet that will penetrate deeply while still having some expansion. Solid copper bullets like the Winchester Razorback, Hornady GMX, or Barnes Vor-tx would be a good choice. They have a high weight retention, good penetration, and good expansion. Hunting can make you a better "shot" by requiring you to fire your weapon in a timely manner and focus on a target that is not static. Techniques used in feral hog hunting (baiting, night hunting, use of hunting dogs), can vary depending on your location and what your state regulations allow. In many locations, there is no "closed season" on these animals, so this type of hunting offers a year round opportunity to practice your shooting techniques and hone your skills. It is important to be knowledgeable about and follow these regulations...the opinions of those who may be negative or undecided about hunting, firearms in general, and modern sporting rifles in particular are at stake. Once you are informed about these regulations, it may be helpful to research hunting techniques and locations specific to the area in which you will hunt. Local outdoor sporting goods stores may have staff that can offer assistance or point you to a place where you can find this information. The Internet has plenty of forums and websites devoted to predator hunting, and a fair amount of helpful information can be acquired by visiting them. Predator hunting is a great way to increase your opportunities to use your AR-15 and can be a nice change of pace from target shooting or even professional, defensive training classes. Thanks for reading our blog. If you have any questions about the AR-15 rifles we produce or any of the AR parts we offer at www.del-ton.com, please feel free to contact us. Wow..it's amazing blog for hunting purpose.i like your blog and i refer this blog who are interested about this.i want to know lot of information about hunting blind from this blog.really it's very helpful and very effective for all hunter. Hunting is a standout amongst the most loved American past occasions. Amid spring season, families run to places around the nation where turkey chasing is the best action. For the individuals who might love to attempt their hand at this come spring time, here are some spring turkey Hunting tips to recall. I find a very good website for the hunting calls , If you want you can visit this site.